In the interaction between Maria and her employer, the employer chooses the wage, and the worker responds by choosing how hard to work. In this Leibniz we analyse the employer’s wage-setting decision mathematically. How should Maria’s employer choose the wage? We will show first that, in order to maximize profit, he should choose the wage that minimizes the cost per unit of effort, taking into account how Maria will respond. We can now see that profit depends on the number of units of work, , and the cost per unit of work (or effort), . It is clear from this expression that to maximize profit, the employer should set the wage so that the cost is as low as possible. 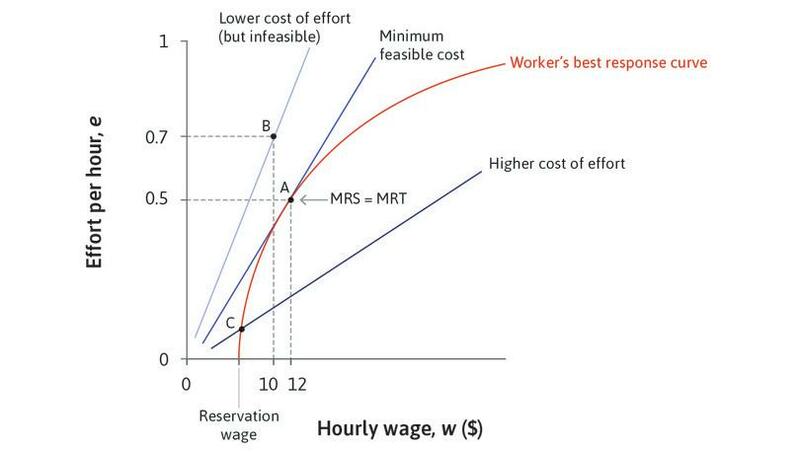 This condition for the wage is illustrated in Figure 1, which reproduces Figure 6.6 of the text. The straight lines are the isocost lines for effort, which have slope . At point A, the equation above is satisfied: the slope of the isocost line, , is equal to the slope of the worker’s best response curve, . For the best response curve shown in this diagram, , and the corresponding level of effort is = 0.5. Minimizing the cost of effort. Figure 1 Minimizing the cost of effort. In the diagram, the steeper isocost lines correspond to lower costs per unit of effort (higher , lower ). So we can see that point A is the cost-minimizing point on the best-response curve. To check mathematically that the wage satisfying the first-order condition, , corresponds to a minimum point of the function , we should work out the second derivative and check that it is positive when . If you do this, you will find that the concave shape of the best response curve, expressed mathematically by the condition , guarantees that minimizes the cost. Notice that depends on and but not on . The numbers in Figure 1 correspond to the case where , and . Read more: Sections 7.1 and 8.1 of Malcolm Pemberton and Nicholas Rau. 2015. Mathematics for economists: An introductory textbook, 4th ed. Manchester: Manchester University Press.